You’ll find everything from Bul Go Ki to Tonkatsu Domburi…to Loco Mocos at Restaurant Osaka. I find myself coming here at least once a month for their homestyle cooking and maybe a beer or two from the lounge. Osaka’s has two rooms: a lounge and a restaurant. Both rooms serve the same food, but one room is darker and has a more chill feel… sometimes it’s nice to eat in there. It is usually crowded with a full parking lot, and tonight was no exception. Within a couple minutes we were served some miso soup. The waitress was very nice and friendly. 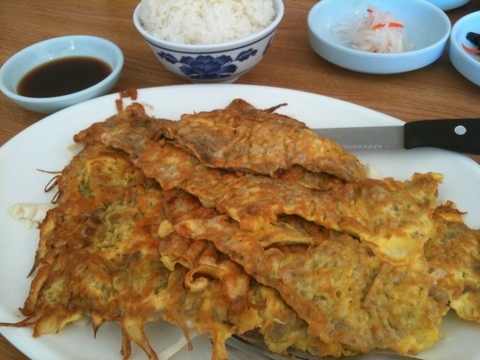 Very yummy with fresh crunchy green onions. 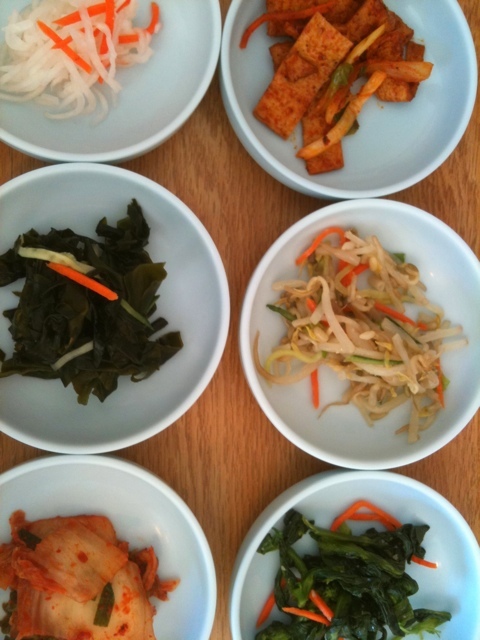 Since I ended up ordering a Korean dish, I was also served these sides. The kim chi was good. Spicier and more flavorful than the average kim chi from other places. The pickled daikon was nice and crisp. On the right are strips of well cooked potatoes seasoned with sesame oil, it seemed – nice flavor. I was originally going to order the Spicy Chicken, which I was told was really good by the waitress, but she said that she prefers the Spicy Pork since it’s more tender. So I ordered the Spicy Pork ($8.95). The generous portion of Spicy Pork was served over a bed of vegetables on a hot metal plate shaped cutely like a cow. 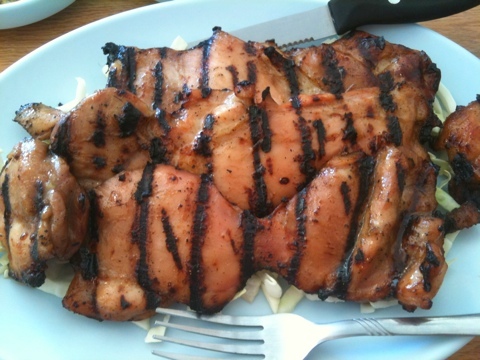 It smelled wonderful, and I love how it looked with the nice dark charred grill marks. The meat was very tender and juicy. The flavor of the meat was not too spicy, but I could taste that the marinade permeated through all the meat… it tasted great! The vegetables were nice to eat with the pork as well. Also ordred was the one of the specials, Sweet Sour Spareribs (~$7). These spareribs were very tender and tasted great. The bones were soft enough to eat. There was not too much vinegar either. It tasted just right. The mac salad was one of the better mac salads I’ve tried… it had great consistency and flavor… it tasted like half potato and half macaroni. We were also served some hot tea later. 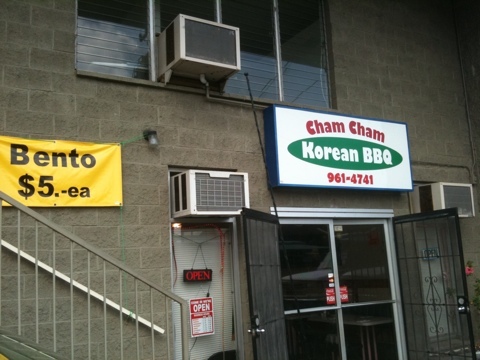 The food was great on this visit, and they are pretty consistent with the food quality. Unfortunately, I have not yet tried their loco moco. Also, I don’t recommend the saimin from here. Everything else I’ve tried was great, though, and the service is very pleasant! You are currently browsing the archives for the Korean category.